The controversial horror/action/stealth game will be joining the PS2 Classics section on May 14th. In 2003, Rockstar Games made one of the most violent and controversial games ever to land on the PlayStation 2. Manhunt placed players in the shoes of death row inmate James Earl Cash. On the night of his execution Cash awakes in a mysterious urban labyrinth where he's forced by a deranged film director to fight for his life against packs of human hunters out for his blood. Now, In just a few days, gamers will soon have another chance to partake in this tale of kill-or-be-killed. 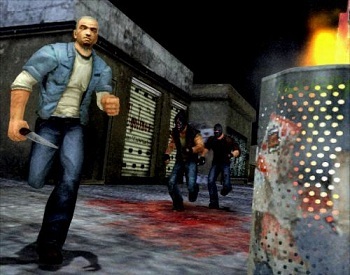 Rockstar has announced that Manhunt will be coming to the PlayStation Store as a PS2 Classic on May 14th, with a price tag of $9.99. This game's re-release is likely to be less pleasing to some than to others. Manhunt, like its sequel, was the object of a lot of controversy. Many were disturbed by the game's extreme violence and politicians quickly began citing it during attempts to pass videogame regulation laws. In the UK, the game found itself at the center of a murder investigation as police tried to uncover the reason behind the killing of Stefan Pakeerah by his friend Warren Leblanc. When a copy of Manhunt was supposedly found in Leblanc's bedroom, it was raised as a potential influence. It was later discovered the game had actually belonged to the victim, Pakeerah. Personally, I've always had a soft spot for Manhunt. It has some problems, to be sure. The gameplay, for instance, pretty much jumps off the rails the second guns are introduced. That said, the better portion of its experience is a tense game of cat and mouse as you try to avoid packs of racists, street gangs and mental patients scouring the game's bleak environments to find you. It pulls off its stealth mechanics better than many other sneaking games and is one of the few titles I've played where the atmosphere is believably and consistently threatening. Even today I can pop my copy in and know from the get-go that it will scare me all over again.